Welcome to Impulse Gamer... Tell us how you both became involved in Wizards vs Aliens? Percelle: I remember receiving an audition from my agency in November 2011, for an ‘untitled Russell T Davies and Phil Ford project’ thinking to myself, hang on a minute this is a really big project with Russell and Phil behind this show. The audition process was a long process for me, I think it was roughly 11 rounds that I went through, with the project auditioning thousands of boys, but I kept strong, focused and I just knew some boys might be more talented than me, but my hard work will shine through I believe that ‘hard work beats talent, when talent doesn’t work hard’. 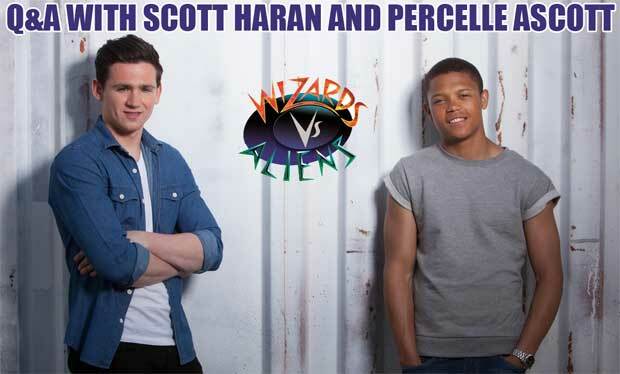 Scott: My involvement with Wizards came from the normal auditioning procedure. I met casting director Andy Brierley, at my first audition and we went through two of the scenes from the show on the programme and had a great chat. I was then invited to a re-call where I came back to see Andy Brierley, producer Brian Minchin and Director of episodes 1-4 Daniel O'Hara. We went through the two scenes I had already done again and two extra scenes. Around a week later I was lucky enough to receive a call saying I had got the part, I was ecstatic! What is the most difficult aspect on working on this TV show? Percelle: I think in the beginning of the first series I struggled with just the fast pace and adapting myself to a new environment, I started to feel not so sure in my ability, but we have a fantastic cast and crew who all support each other, and with the love I received I bounced back. Scott: I think the most challenging part for me was getting used to the schedule, the hours are really long and I am lucky enough to be a lead which means I am in a big percentage of scenes, which also means not much time to rest, it’s quite a full on journey... but I wouldn't have it any other way! Percelle: Being given this opportunity is the most rewarding part to this project, I’ve learnt so much, working with the experienced cast and crew we have, has been so beneficial in my growth. Scott: There are so many rewarding aspects working on a show like this but I think for me it’s when were at the wrap party and we all get to watch the dvd trailer, which shows all the hard work everyone has put in over the past 15-17 weeks! It’s such a rewarding feeling and everyone feels so proud of what we all have achieved, it’s a feeling you can't beat. How do you "make believe" when you act with the special effects? Percelle: I’m a spiritual person in the sense that I believe in energies and being able to work with the universe, I’ve used this in my work, being spiritual allows me to go to a deeper place where I can focus my thoughts and my being to be where I want it to be, so before takes I arrive early on set, to focus and believe in the world that my character is set in. Scott: When acting with special affects the best way for me is to just throw yourself into it 100%, believe what’s happening, imagine if what is happening in the scene is actually happening to you in real life. I’d say a massive level of concentration. But also we have great people there to help us, if there are questions or things we need to know or aren't sure about advice is never far away. Between both yourselves (Scott and Percelle), who is the "jokester" of the two? Percelle: I would say Scott is the ‘jokester’ out of the two of us, I can be a bit boring and serious when on set. Scott: I would have to say I'm the joker out of the two of us, I like to try and play a few pranks here and there whenever I get the opportunity. There was a time in a scene where me and Percy had to run from exploding computers but Percy had to grab his bag before he could run off, so for a joke before action I kicked 'Benny's' backpack further under the table so it would take Percy a little longer to escape, that was a funny moment. Do you get much time to goof on the set or do any pranks? Percelle: Not much time, filming is very hectic, anytime off is used to conserve our energy or to look at scenes that are coming up in the schedule. Scott: Like I said me and Percy are usually under quite an intense schedule which involves us being on set nearly all the time, so any chance to joke or mess around we take it... Or I do anyways! Ha, ha. Percelle: I play Benny Sherwood, he isn't the most popular kid at King's Park High compared to Tom; but he isn't just your ordinary geek. Benny is a super genius, a skilled ally to Tom; throughout his journey in the show, Benny also shows signs of bravery, strong minded in what he believes and can be quite comical in certain events to break the tension. Scott: Tom is the typical cool kid, at school he's popular with everyone and has lots of friends around him. He's pretty sporty and has a massive love for football which he seems to excel at... with a little help here and there! He's the typical good all rounder. Not so much the academic though! Percelle: I would definitely say Benny, what makes him cooler, I think it’s because Benny is very sure of himself with nothing to prove. Scott: I think I’m gonna go with Tom! He's the cool kid at school and has all the aspects of the typical cool kid. Popular, good at sports... and he's got magic! Do either of you have any alien stories? With that said, do you believe in aliens? Scott: I’m not sure I believe in aliens as such but I definitely think there’s some kind of other species out there... way out there somewhere! 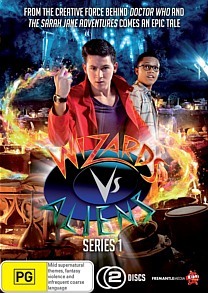 Can you give us a few spoilers into the next season of Wizards vs Aliens? Percelle: Nope, I think I would be ruining your experience of watching Wizards vs Aliens, just make sure you’re ready for what’s to come. Scott: Ha, ha I wish I could. All I'm going to say is the second series picks up from where the first series finishes in the sense that there are a lot of avenues explored. Questions that were asked after the first series are answered in the second. It’s bigger and better! How do you guys handle your fan base? Percelle: We receive quite a lot of messages from fans through social media, I think the best way to handle the support you receive is to show how much you appreciate that support, having respect for the people who enjoy what you do, we have a young fan base and I’m sure for a lot of them it can be daunting, so it’s best to keep being humble and genuine. Scott: To be honest it’s not something that I 'have' to handle. After the series aired I developed a slightly boosted profile through social media websites where people would say positive comments from time to time, which was great and always lovely to hear. But I guess I'm lucky enough to not have too much of a drastic change to my life since the show has aired. What's the coolest thing about your fans and being an actor? Percelle: The best thing about the people who support me in what I do, is how diverse they all are, I can receive support from a young age group to an older age group who all have different interests. The best thing about being an actor… I love acting because of how you are able to communicate an emotion or convey a character that has the power to manipulate the audience’s feelings, I can be a shy person, so I’ve always used acting to express myself. TV/film has been societies way of escapism, which I’ve always been extremely intrigued by; TV/film is also a form of education, through story lines and characters people have learnt new things they haven’t explored, especially when you can teach kids about morals and principals I think it’s highly important. These are some of the reasons why I love being apart of this industry. Scott: The coolest thing about the fans is what I mentioned above, it’s always great hearing positive comments about the show and certain things people enjoyed about it, it’s nice to know viewers enjoy the show as much as we did making it! The coolest thing about being an actor is getting to do what you love as a job. I never wake up in the morning dreading having to go to work, I love it. Everything about it, I'm lucky enough to be in a position to get to do what I love on a daily basis. Which actor or actress would you love to work with? Percelle: Actors who inspire me, such as Daniel Day Lewis, Michael Fassbender, Tom Hardy, Christian Bale and actresses like Jessica Chastain, Carey Mulligan, Michelle Williams, Viola Davis etc… I guess actors/actresses who really believe in the method, as you can see they completely believe in their characters and the world they exist in, you never know what they might throw at you. Scott: That list is endless, constantly growing! But I would have to say two huge role models of mine are Leonardo DiCaprio and Jake Gyllenhaal. They both are huge influences for me and I admire their work so much. Those guys are actors I constantly try to learn from. Besides Wizard vs Aliens, do you have any roles in other movies or TV series? Further more ‘Youngers’ series 2 has been commissioned and filming will begin in November this year. I’ve been recently cast in a new film called X+Y, with further information due to come out soon, but shooting will begin soon in Sheffield and Taiwan. 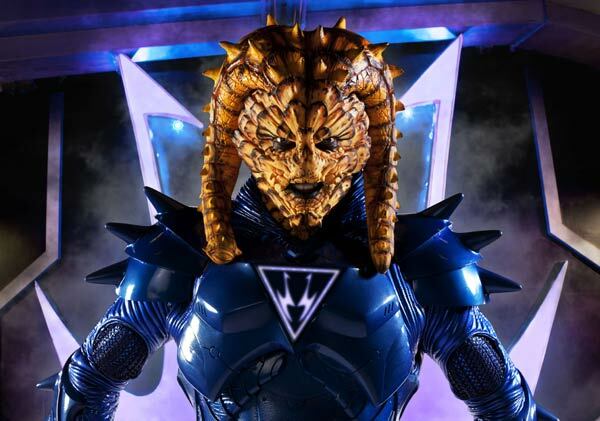 Scott: At the moment I'm back to the process of looking for the next project, I feel like I have learnt a huge amount from two seasons of Wizards and developed as an actor, so I'm really excited to see what challenges might be round the corner. Thanks for being part of Impulse Gamer and all the best for the next Season of Wizards vs Aliens!